Spindle by E.K. Johnston, Hyperion, New York, NY, 2016. 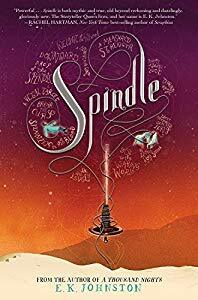 And so begins Spindle, a young adult novel of extraordinary prose, with a back story in classical fable that weaves the time-honored archetypical plot of good vs evil. Spindle begins in the voice of the demon, explaining how humans, for centuries, have foiled those like her from sewing their dark magic. Bound as they are by iron, demons can do little but watch the humans. They have, however, two advantages: they cannot die and they can learn. Spindle begins with the telling of a story. The story Yashaa has heard since he was a small boy. A story of how a demon came uninvited to a small princess’ birthday party and cast a vicious spell on her. A spell that would ruin the lives of all who lived in Kharuf but a spell that would specifically torture the spinners, who forever after would be exiled, as practicing their craft in Kharuf caused them to be desperately ill. The demon had made sure of that. So, the Spinners from Kharuf travelled to the desert, the home of their ancestors. But Yashaa’s mother chose instead to take her son and what few other spinners remained in Kharuf over the mountains to Qamih in hopes that they could ply their trade there. But a harsh guild system would not allow them to sell in the public markets. Life was difficult and Yashaa has since blamed the little Rose. This novel presents a fascinating culture: a mix of humans, piskey’s, sprites, dragons and, of course, demons. That alone should attract readers of fantasy, but it is so much more. Johnston takes a fairy tale that readers are familiar with and develops it into a story of mature characters who wrestle with good and evil. In the end it is the tale of making the choice to serve the needs of the many, rather than capitulate to the pleasures of the moment, certainly a message worthwhile in a teen novel.